The Glycemic Load Diet, by Rob Thompson, MD is a refinement of earlier low-carbohydrate diets. It aims to reduce the glycemic load in the diet – the impact on blood glucose levels of a serving of a given food, as identified in the Glycemic Index. The increased consumption of starchy carbohydrates, particularly wheat, is held to blame for the obesity problem. Also, the claim is made that insulin resistance (said to be present in 22% of the population) would be less evident if starchy carbs like rice, potatoes and bread were reduced. Insulin regulates glucose consumption in the body, mainly the muscles. If these become insensitive to insulin (called insulin resistance) then weight-gain results. Refined carbs are the major source of glucose in the diet. For example, it is suggested that no more than a quarter-serving of these foods be consumed at one sitting, alongside cutting out drinks and juices with added sugar. The Glycemic Load Diet also requires 30-40 minutes of walking every other day, with the objective of activating ‘slow-twitch muscle’ to improve the insulin resistant condition. The glycemic index measures the effect on blood glucose of a given amount of carbohydrate from a particular food source, in comparison to the same amount of carbohydrate in white bread as the standard (set at 100). The glycemic load corrects that figure for serving size or amount consumed, and it this glycemic load which forms the basis of the Glycemic Load Diet. The advice given is that the total glycemic load in foods consumed each day should be under 500. This list is taken from the Glycemic Load Table in Dr. Thompson’s website as quoted in his book The Glycemic Load Diet. As such it uses a different formula than other measures of Glycemic Load such as the University of Sydney. 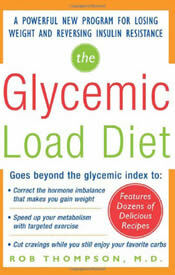 The book The Glycemic Load Diet retails for $16.95 contains about 80 pages of recipes. There are no meal plans as such. After a lot of failed attempts at diets, following the Glycemic Load diet is the only diet I’ve followed that’s resulted in significant weight loss for me. After following the program for 3 months (particularly, religiously following the “no solid startches” and “no sugary drinks” rules), I lost 25 pounds. However, to be objective, I’ve not been able to budge much past that 25lb milestone. It could be the diet, or it could be me, as I found the variety of the diet very tiring, and would sneak in servings of startches spread through the week just to get some variety. In the short-term, my appetite has decreased, and when adhering strictly to the diet as I did in the first 3 months, the urge to snack decreased as well (something a serving of grapes and cheese always tended to fix). Long-term, I can’t attest to, but I love how simple the core rules are: they’ve made adherence (on the whole) much easier. I have been following the diet outlined in the book, more than faithfully for 5 weeks now. Not only have I not moved the scale at all, I have actually put on a couple of pounds. I don’t understand and don’t know what to do now. I find this very interesting and would like to know more.